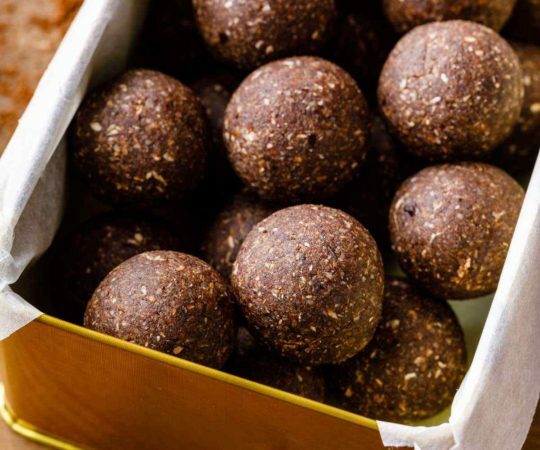 If you’re looking for a sweet Paleo treat or a hostess gift for your next social engagement, these tasty and beautiful matcha bliss balls are just the thing you’re looking for. 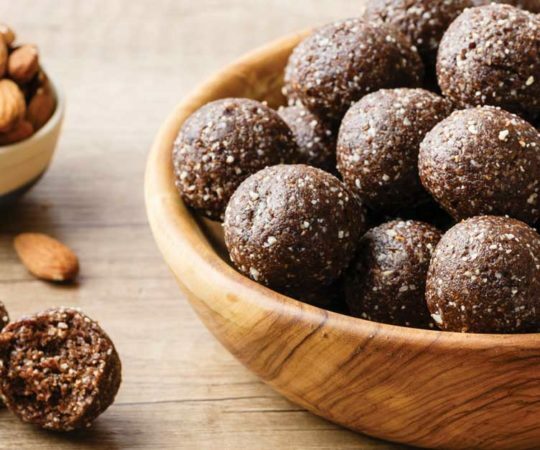 They look like truffles and have a naturally sweet flavor and a satisfyingly chewy texture. And the best thing about them? No one will know they only took you a few minutes to whip up! Matcha is all the rage these days but it’s far from new. In fact, it’s been around for hundreds of years in Japan and China. At its most basic level, matcha is a type of green tea. But it’s actually far more complex than that. Matcha isn’t just any green tea in powered form: it’s grown differently, processed differently, and, for centuries, has been served differently. 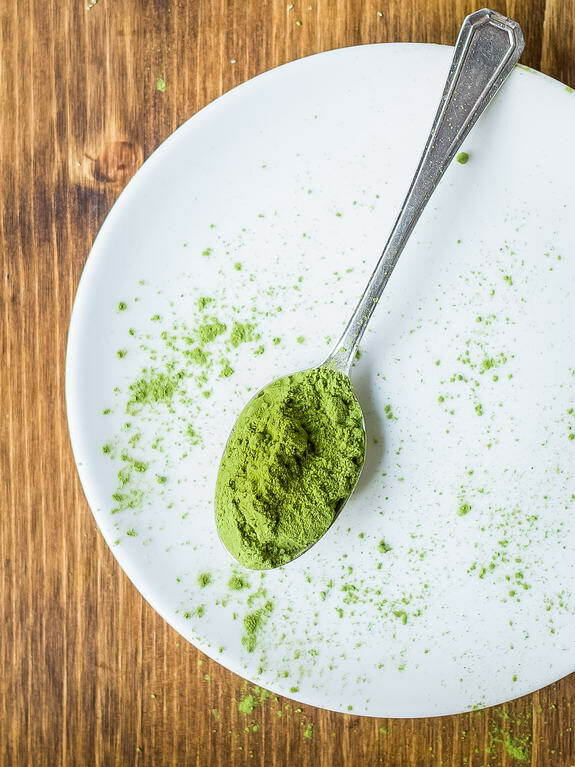 For the last 20 days of the plant growth, plants that will produce matcha are grown in the shade, which increases their chlorophyll, turning them a more vibrant green color and increasing their levels of the amino acid theanine, as well as the caffeine level. The best leaves are then picked, dried, and ground to a fine powder using with a stone grinding wheel, so as not to damage the flavor of the leaves. This extensive process is why matcha is labeled as such, as opposed to just being another green tea, and why it is almost always more expensive. But many people think it’s worth the extra cost. Lovers of matcha claim that while it gives you that caffeine buzz, it is much “smoother” than black tea, coffee, or even regular green tea. That’s likely because of the theanine, which has a calming effect. Theanine also gives the tea its trademark savory (umami) flavor. Matcha is also prepared differently than a regular tea. Regular tea is made with dried leaves that are steeped in hot water. Conversely, matcha powder is whipped into warm water, causing the powder to be suspended in the water. That means if you let your matcha sit too long, it will separate and settle, unlike with regular tea. But in this recipe, we’re not using matcha for tea! 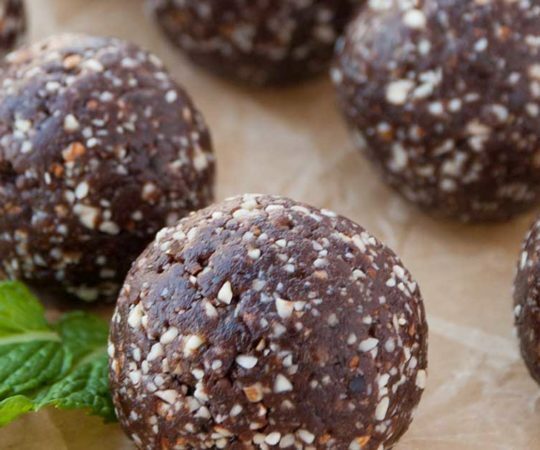 We’re using it to lend a “certain something” to our bliss balls. 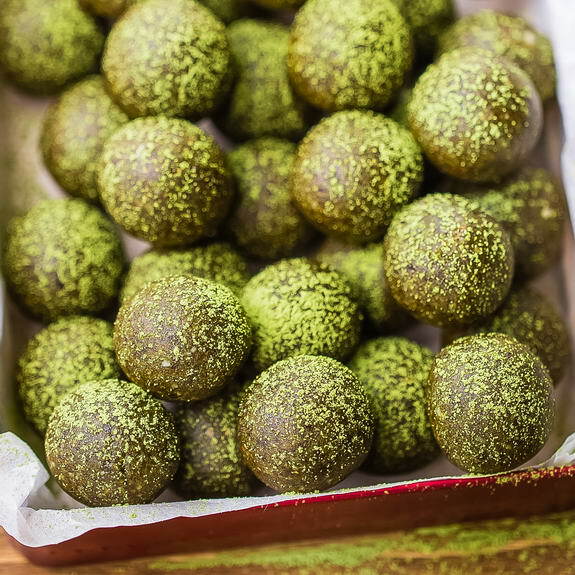 If you tasted these matcha bliss balls without knowing what was in them, you probably wouldn’t guess it was matcha. 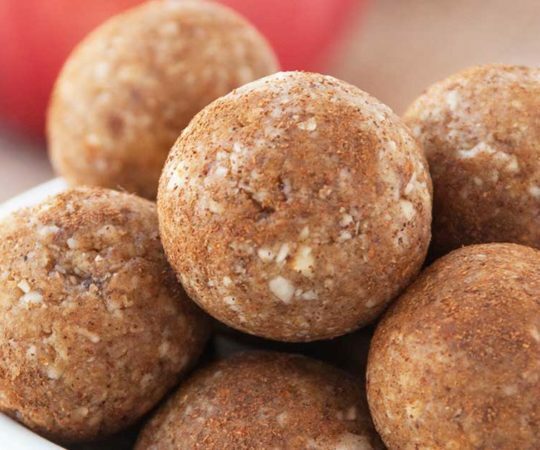 You might get dates, hazelnuts, coconut, and vanilla – but you’d know there was something else in there too – something you couldn’t quite put your finger on. That’s the matcha. It’s a subtle flavor, but rounds out the sweetness and nuttiness of this recipe in a wonderful way. Now, I thoroughly encourage you to hoard these babies for yourself. But, if that makes you feel guilty or something strange like that, here is another idea for you: get a small gift box and line it with wax paper. 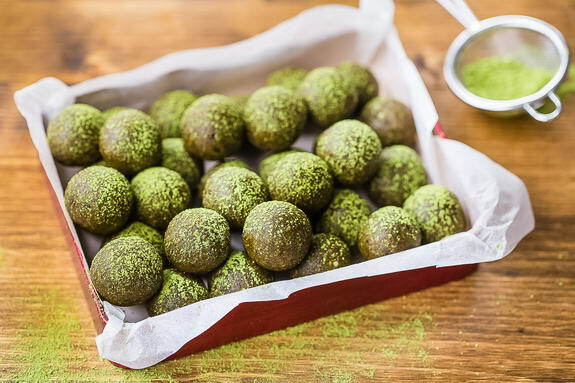 Place a layer of matcha bliss balls inside, put the lid on top, and tie a ribbon around the box. Suddenly you’ve got what looks like a professionally done-up hostess gift (or host gift – don’t want to leave the guys out!). Not only are you bringing someone a cute, sweet treat, but you’re giving them a little box full of healthy stuff, too. Who knew you could do both at the same time? 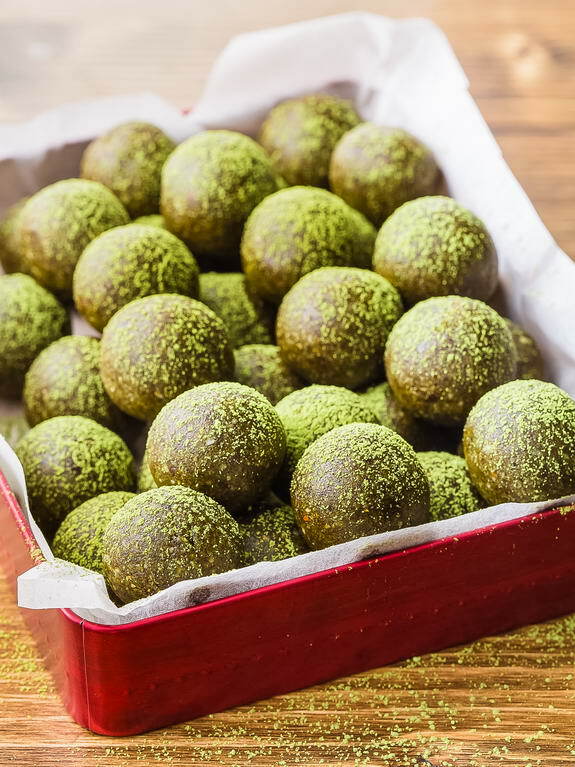 So whether or not you’ve tried matcha tea before, get on the bandwagon and make yourself a batch of these matcha bliss balls. I predict they’ll become the next hit thing – at least in your house! 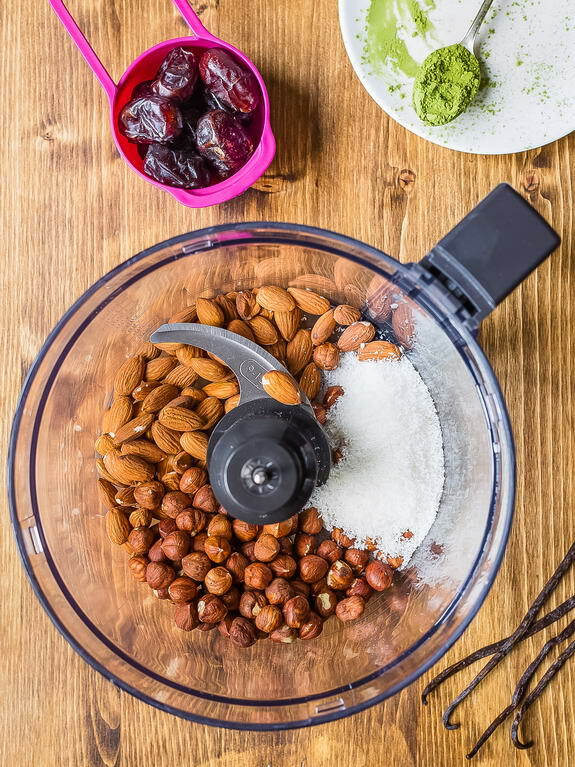 Place the almonds, hazelnuts and coconut in a food processor and process until chopped. Add the matcha and pulse a few time to combine. 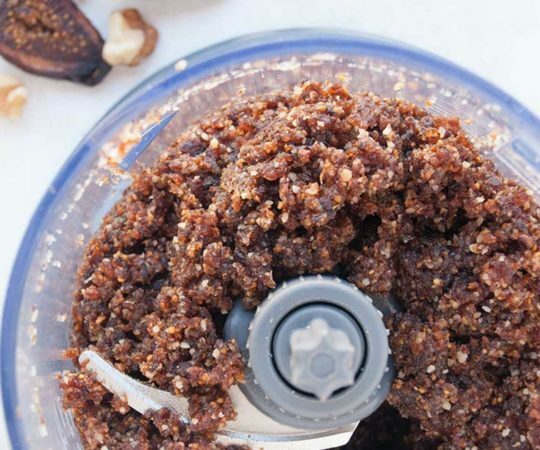 Add the Medjool dates, vanilla paste and water and process until combined. 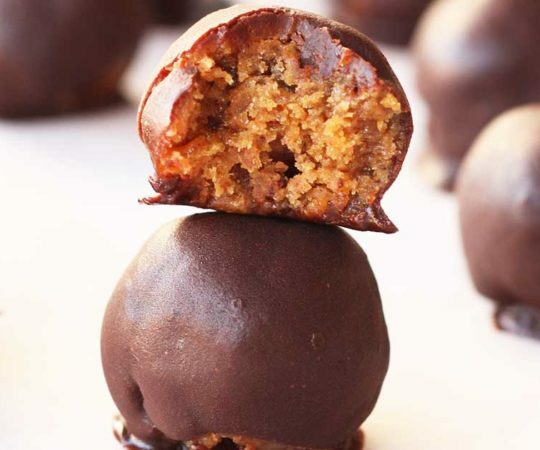 Take heaped teaspoons of mixture and shape into balls. Dust with matcha and serve. Do you soak the almonds and hazelnuts? And can you just use all almonds or substitute any other nuts? I have not seen hazelnuts to my knowledge? 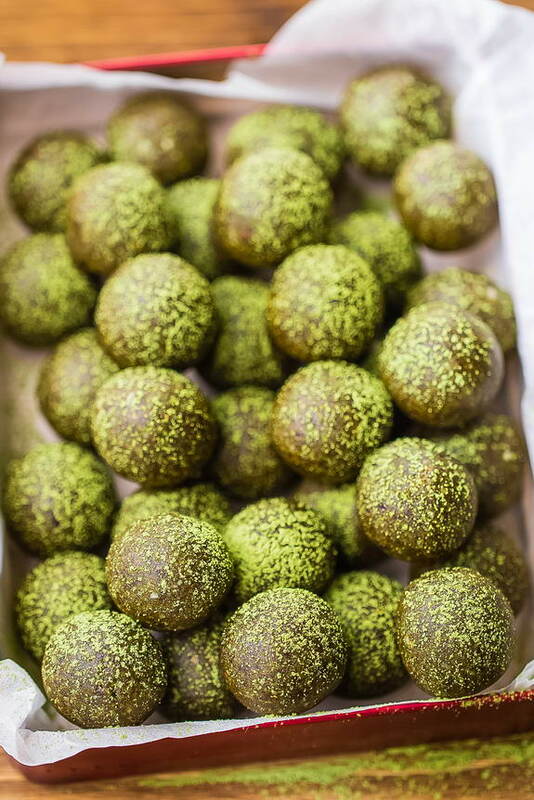 I want to make the matcha bliss balls, but I am unable to use much caffeine. Is there anything I can use to replace the matcha, or at least some of it?